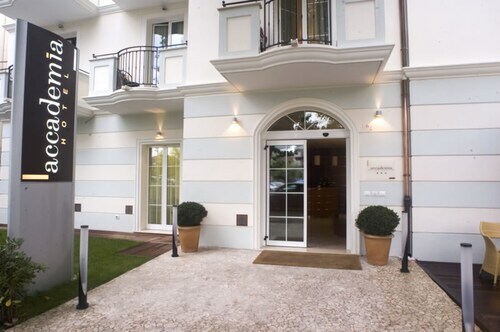 Situated in San Marino, this hotel is within 1 mile (2 km) of Montale Tower, St. Francis Museum and Piazza del Titano. State Museum of San Marino and Piazza Garibaldi are also within 1 mile (2 km). 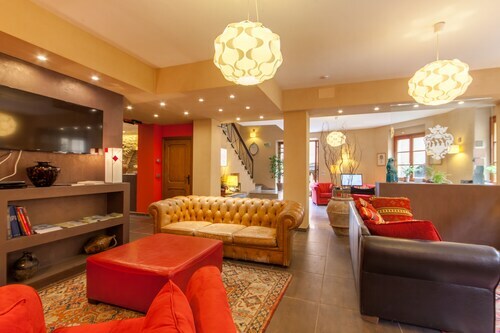 Located in the heart of San Marino, this hotel is steps away from Piazza Garibaldi, Liberty Square and Basilica of Saint Marino. State Museum of San Marino and Museum of Curiosities are also within 5 minutes. 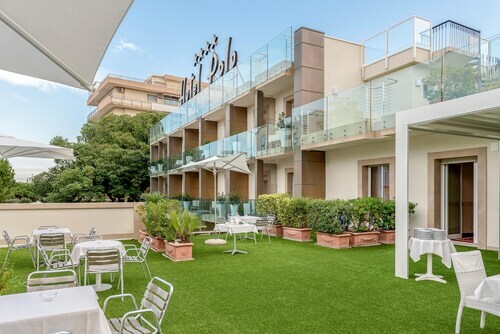 This family-friendly San Marino hotel is located on the boardwalk, steps away from Museum of Curiosities, Piazza Garibaldi and St. Francis Museum. Monte Titano and State Museum of San Marino are also within 5 minutes. Situated in Borgo Maggiore, this spa hotel is within 3 miles (5 km) of Montale Tower, St. Francis Museum and Piazza del Titano. 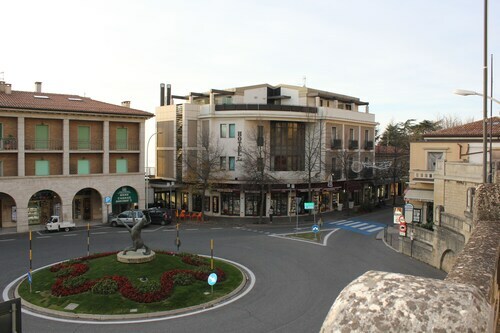 State Museum of San Marino and Piazza Garibaldi are also within 3 miles (5 km). 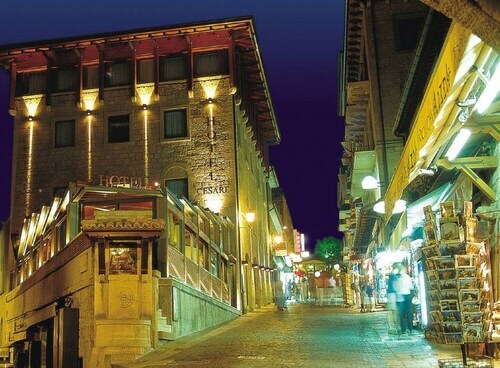 Situated in San Marino, this hotel is steps away from Museum of Curiosities, Guaita Tower and Piazza Garibaldi. Basilica of Saint Marino and Liberty Square are also within 5 minutes. 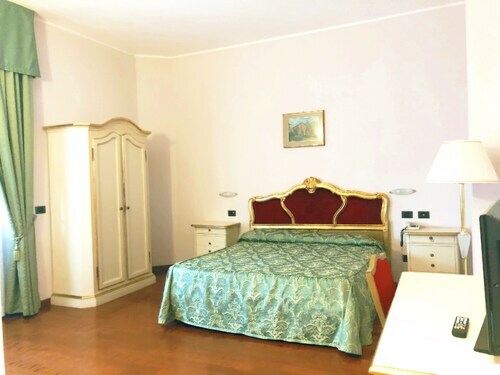 Located in the heart of San Marino, this hotel is within a 10-minute walk of St. Francis Museum, Piazza del Titano and State Museum of San Marino. Piazza Garibaldi and Palazzo Pubblico are also within 15 minutes. 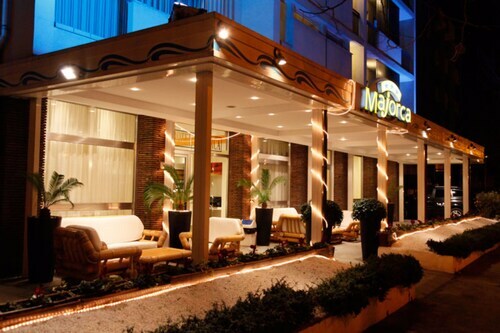 Situated in Serravalle, this hotel is 1.1 mi (1.8 km) from Stadio Olimpico and 3 mi (4.9 km) from Montale Tower. Aviation Theme Park Rimini and Piazza Garibaldi are also within 6 miles (10 km). 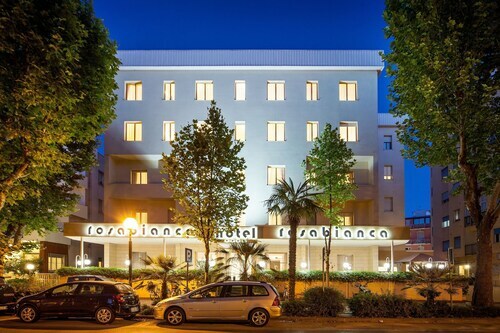 Located in the heart of San Marino, this hotel is steps away from Piazza Garibaldi, Liberty Square and Basilica of Saint Marino. State Museum of San Marino and Palazzo Pubblico are also within 5 minutes. 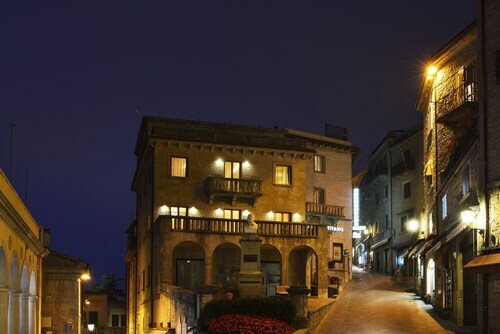 ebookers can help you scan through a list of hotels to find a place to stay in San Marino (all). 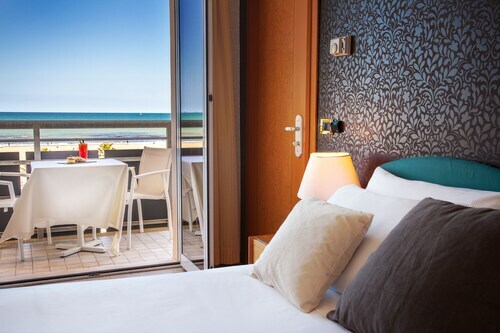 Our website rapidly provides favoured hotels in the area so you'll have an array of options to pick between. We make it very easy to narrow your search by providing a variety of different tools you may find useful. A handy aspect of our website is our map, which gives you an easy way to target a particular area for your visit to San Marino (all). You may want to change the filters and sort by area or popular location to identify accommodation near the city's main attractions. 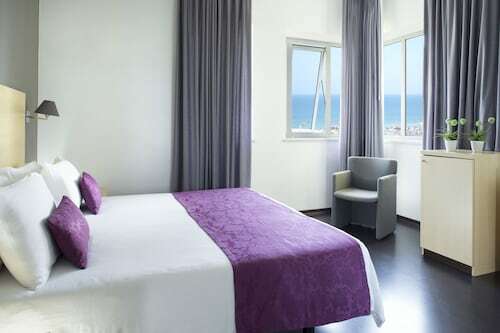 If you're searching for a place to stay at a bargain price, you can filter by price per night to find affordable accommodation that matches your budget. 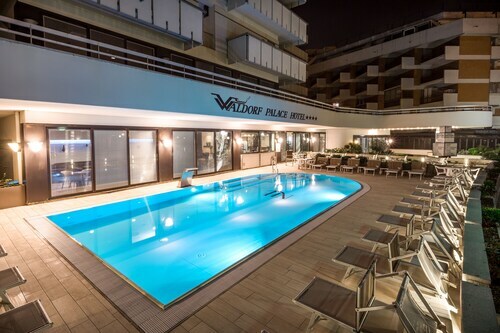 If you're interested in certain facilities and services such as free wifi or an indoor pool, you might decide to filter your search so you'll have everything you'd like to make sure your trip to San Marino (all) will exceed all of your expectations. 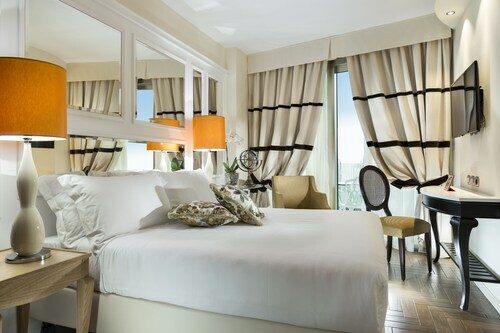 We're interested in helping you decide how to get to your destination now that you've found your San Marino (all) hotel. You'll find that ebookers provides lots of transport options for hired cars and flights to make it easy for you. You can look for a flight by airline, airport location, or departure time to find one that suits you. You'll likely want to look into ways to get around after you arrive in San Marino (all). You might want to consider arranging to have a car for hire ready for your arrival by reviewing our car hire deals. You might want to explore all that San Marino (all) has to offer by taking in some of the top tourist activities while you're there. Arranging a car hire is a good solution for travelers who want to make day trips convenient and accessible so you can be sure to experience everything San Marino (all) offers. It's easy to arrange all your travel plans when you book on our site. Figuring out what you want to do in San Marino (all) is all you need to focus on now that you've booked your hotel and transport for your holiday. From helicopter rides to dinner cruises, you can browse our site for Things to Do. You'll be sure to find activities that are perfect for kids and adults alike when browsing our site for tours in San Marino (all). You can click through photos of various tours and excursions on our page to help narrow down the top picks for your holiday. If earning travel rewards and upgrades appeals to you, you can book through us in order to make the most of your budget. Now all that's left for you to do is enjoy your time away. Schönes , modernes Hotel . Reichhaltiges Morgenbuffet . Das Hotel ist sehr schön und hat eine tolle Lage. Die Zimmer waren sehr hygienisch, gut ausgestattet & hatten eine funktionierende Klimaanlage. Das Personal an der Rezeption war leider sehr unfreundlich, wo man von einem 4 Stern Hotel mehr erwarten dürfte. Das Frühstücksbuffet ist auch nicht gerade überwältigend gut gewesen. Strand In der nähe. Shoppingmöglichkeiten. Sehenswürdigkeiten in der Umgebung. Ruhiges und sauberes Hotel ,freundliches,hilsbereites Personal,reichhaltiges Frühstücksbuffet. Wir sind nicht in dieses Hotel eingezogen weil man uns zwei Zimmer angeboten hat die nicht nur nicht saubern waren sondern wortwörtlich unhygienisch und nicht bewohnbar. Schon mal gar nicht wenn man mit einem 4 Jährigem Kind dort eine Woche verbringen möchte. Zum Beispiel haben wir verklebte Haare (wir vermuten Scharmhaare) an der Klo Spülung, Löchern in den Wänden sowie Schimmel an Decken und Wänden vorgefunden. Genauso ging es dann auch mit den Bettbezügen weiter. Harre, kleine tote Tierchen sowie undefinierbar dunkle Flecken... Schon mal gar nicht wenn man mit einem 4 Jährigem Kind dort eine Woche verbringen möchte. Schaut euch einfach die Fotos an... :/ Schade das man nur 6 Fotos hochladen darf... Aber die sprechen schon für sich... Wirklich, ich bin kein Mensch der zu Übertreibungen neigt. Obwohl wir bereits fest vorbehalt hatten haben wir uns nach 36 Stunden Anreise dazu entschlossen ein neues Hotel zu suchen in der Hoffnung das Expedia sofort versteht das das unzumutbare Umstände sind und uns unser Geld erstattet. Da die doppelten Kosten natürlich ein RIESEN loch in die Urlaubskasse hinterlassen hat. Sobald ich hier eine Rückmeldung von Expedia erhalte gebe ich diese gern an euch weiter. Aufenthalt war super. Nettes Personal , saubere Zimmer top.